The romance section, which once had been a large room filled with thousands of romance novels (I’m not exaggerating) was now an alcove with less than a dozen bookshelves. After I got over my surprise, I decided they must have downsized the selection when they had relocated. I couldn’t understand the business decision since romance fiction was their specialty, but these things happen. I then decided to walk to another used bookstore that was a couple of blocks over. (When your metropolitan area is named one of the most literate cities in the country, used bookstores are an expected side effect.) The romance section in this store was decidedly worse. Two shelves. I could have sworn it was at least six the last time I had visited. At this point I was on a mission. I went to every nearby used bookstore and I came to the realization that all of the romance sections have shrunk dramatically. Are people no longer reader romance? It was a $1.08 billion industry in 2015 but it was a $1.37 billion industry eight years before in 2008. Methodology, statistics and math is general aren’t my strengths, so I don’t know if that piece of information gives me an answer. For all I know, the average price of a romance novel has dropped, or it might indicate that not as many people are reading romance. Are romance readers no longer buying print books? Research says that’s not the case. A Study by NPD Books for Romance Writers of America did a survey in 2017 and 92% of respondents identified as print readers. Romance readers had been early adopters of eBooks. Am I just now seeing the impact on the inventory of used bookstores? I’m not really sure how to determine this. According to the Nielsen report, the romance genre accounted for 20% of all e-book sales in the United States in 2015. But would that increase in digital books just now reach the used bookstores or has the numbers increased dramatically since then? Unfortunately, I can’t find any current data. So… my results are inconclusive. All I know is that the lazy, inefficient but fun as a scavenger hunt way I looked for out-of-print books is gone. I’ll miss browsing the used bookstores and discovering hidden gems, but I’m glad romance authors are reverting their publishing rights and uploading their work in digital formats. And, if that option is not available, I can always do some research on the author and her body of work before ordering an out-of-print and hard-to-find book online. 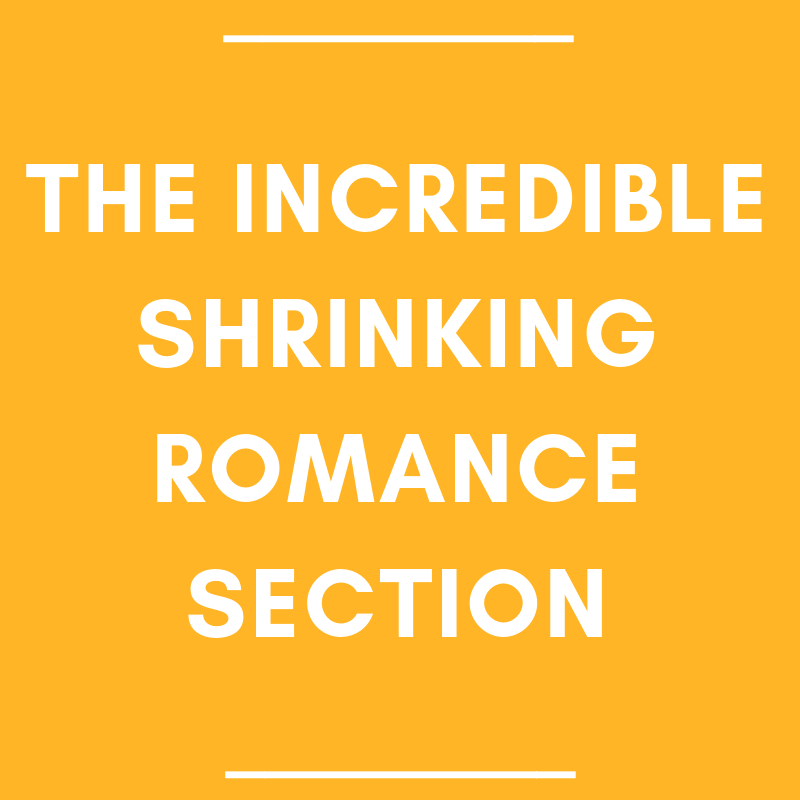 Do you think the romance section is shrinking in used book stores?